My favorite sunglasses lens for low light or overcast conditions is, unequivocally, Smith’s Low Light Igniter. This thing seems to draw light to the eye, even on those days when it seems like getting Noah to build another ark is advisable. And as all of us know, there are days in the PNW each winter when that thought arrises. 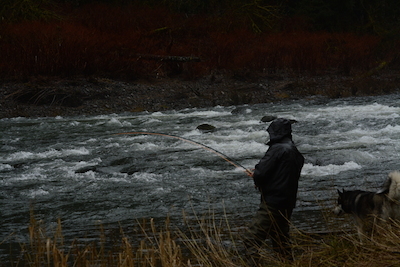 That’s the way it was in Oregon a few days ago, when I was throwing with Jeff Hickman of Fish The Swing. We were fishing the coast and the wind and rain was hitting us in waves. By the end of the day we were totally soaked, all along the arms, all the way to the armpits, and again from the hood to the hips. It was bit miserable at times, but we fished until the very last light, hoping to find steel. Or should I say, another steelhead. Earlier, sometime around 2 or 3 in the afternoon Hickman had said, “Oh, I just saw a steelhead roll.” He dropped me off above the fish, then headed downstream. I stripped off the shooting head and sinktip and rolled it out on a current seam. I think I only cast twice before a fish hammered my fly. A few minutes later I had it in the shallows and Hickman was racing up the bank with my Pelican case, in which I store my camera bodies and lenses. Hickman snapped a few shots of me and at some point my glasses fell off my hat and landed in the rocks. I didn’t think much about it because I’ve dropped Smith glasses plenty of times and never saw any damage from it. So I just picked up the glasses, put them on my face, stared directly into the coastal storm and those sheets of rain being windblasted into my grill, and went on fishing. It wasn’t until two hours later that I took the glasses off my face—it had been so rainy and my glasses were so rainsoaked, that I hadn’t even noticed that the lens was smashed. Hickman and I shared a laugh, for sure, before cruising on to the next run. After that I had to wear a competing brand and the things were so dark I couldn’t even wade along the bank without it being a death-defying experience. Bust into your locker and I smashed your glasses. This entry was posted in Gear, Oregon, Spey and tagged fly fishing for Oregon steelhead, Jeff Hickaman's Fish The Swing, Smit low light igniter lens, Smith Tenet. Bookmark the permalink.